As your toddler starts to transition from purees to whole foods, choking can be a concern. In addition to ensuring your child's food is cut or torn into small enough bites, you should also teach him to chew thoroughly and properly, such as chewing with his mouth closed. If you have a headstrong toddler, teaching proper chewing techniques can be a challenge, but it doesn't have to be impossible. Show your child how you chew. Let her touch your jaw while you chew so that she can feel your mouth move up and down. When you have completed a bite, open your mouth to show your child that the food is no longer in your mouth. Give your child foods that can be swallowed without chewing, such as mashed potatoes or applesauce, for practice. Give your child small amounts and ask him to show off his chewing skills. Repeat the action of chewing along with him so he can continue to follow your example. Make chewing into a game. For example, you can sing a short song or a few letters of the alphabet while your child chews so that she can understand how long she should chew. When you stop singing, she can start swallowing the food. Offer positive reinforcement by encouraging him when he properly chews food. If he displays improper table manners, such as chewing with his mouth open, gently correct him and continue to set a good example for your child. Emphasize swallowing slowly in addition to chewing slowly. Your child must completely chew and swallow food before she gets to take her next bite. The next bite can serve as her "reward" for doing a good job when chewing. Patience is important when your toddler is learning to chew. Many toddlers have a tendency to chew foods slowly because they are not yet accustomed to chewing. Try not to rush your child and expect that he may take at least 10 minutes to eat a small meal or snack. 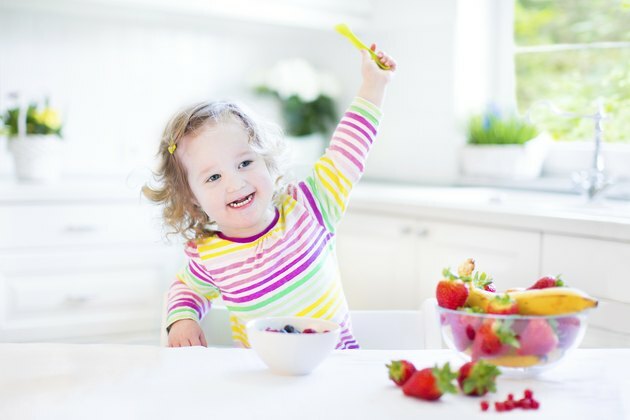 Avoid giving your toddler foods that are difficult to chew, particularly when you are teaching her how to chew properly. This includes nuts, seeds, popcorn, hard candies and raw carrots.